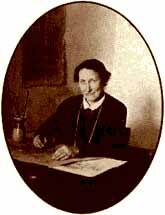 Märta Måås-Fjetterström was a central figure in modern Swedish Textile-Art. She was a master of form, line and composition. She filled every inch of the surface she worked at with a vision of nature experienced at first hand, with every growing form severely chastized to decorative art. It is this direct contact with what her vision had experienced as well inwardly as outwardly that makes each work a new ornamental treasure. Märta Måås-Fjetterström started her own weaving workshop in Båstad, just north of Malmö, in 1919, and continued to run it for 22 years until her death in 1941 at the age of 68. In 1948 the activities were moved from Märta Måås-Fjetterström's original workshop - "Strandgården" - to the present house, designed by the architects Ivar and Anders Tengbom. A group of weavers has administrated and continued to realise Märta Måås-Fjetterström's artistic intentions. For many years Barbro Nilsson was the company's artistic leader, inspired by a wealth of new creative ideas, and herself producing several masterpieces, which displayed supreme mastery of techniques and a deep feeling for colour. New artists have regularly contributed with new designs. They include such names as Marianne Richter, Ann-Mari Forsberg, Barbro Sprinchorn, Kaisa Melanton, Marin Hemmingsson, Ulla Gowenius and lately Ernst Billgren. In cooperation with talanted weavers carpets, art-fabrics, and tapestries are produced for discerning clients from all parts of the world - indeed, from wherever, they all appreciate the beauty of outstanding art textiles.